Puzzle Dungeons ($0.99 → Free, 23.5 MB): A puzzle RPG that has you matching tiles to build up your character and fight off your enemies. Match three or more like tiles to clear them from the board and gain their abilities. When an enemy appears on the board, try to take it out as soon as possible to free up the space by swinging your sword and casting spells. The game includes three characters to choose from, three maps, and leaderboards via Game Center. Puzzle Dungeons is available for free for a limited time. It has a 3.5-star rating with a total of 38 ratings. HomeTeam ($1.99 → Free, 1.1 MB): This sports app allows you to track rosters, schedules, and contacts for all of the teams in your family or those that you coach. As a parent, you’re able to view the schedule of upcoming games, add them to your personal calendar, view contact info, and communicate with other parents. As a coach, you’re able to manage rosters, add game info to your calendar, and communicate with parents. HomeTeam is available for free for a limited time. It has a 4-star rating with a total of 67 ratings. GDrive Exporter for Google Drive ($3.99 → Free, 1.8 MB): Take control of your Google Drive documents with this business app. It allows you to export all of the files stored on Google Drive and save them in whatever format you prefer. All exported files can be viewed offline right within the app. You’re also able to open exported files in other apps or share them via email. GDrive Exporter for Google Drive is available for free today only (07/12). It has a 4.5-star rating with a total of 6 ratings. NxtApp 4 Kids ($2.99 → Free, 8.8 MB): An educational game that will help your child practice basic math. Each of the five stages requires your child to complete sequences as quickly as possible by applying different math skills. If they correctly complete a sequence they will receive a dancing gold star. If they input an incorrect number, however, they’ll still be able to see the correct answer. The game also includes leaderboards via Game Center. NxtApp 4 Kids is available for free for a limited time. It has a 4-star rating with a total of 88 ratings. Girls Like Robots ($2.99 → Free, 46.4 MB): Girls Like Robots. That’s just a well known fact. You must try to arrange the girls and the robots to achieve maximum happiness in this puzzle game from Adult Swim. Each level presents you with an empty grid. Place your girl, robot, and other character pieces into those empty spots to fill the happy meter. You’re going to have to break some hearts in the process, but it’s for the good of the group! The game includes a large cast of characters, 110 puzzles, and achievements and leaderboards via Game Center. Girls Like Robots is available for free today only (07/12). It has a 4.5-star rating with a total of 564 ratings. Quell ($1.99 → Free, 28.8 MB): Collect all of the pearls in each level as quickly as possible in this zen puzzle game. You must slide a droplet around obstacles, away from danger, and through pathways by swiping your finger across the screen. Grab all of the pearls in the target amount of moves to earn a perfect rating. The game includes 80 levels, a custom soundtrack, and achievements and leaderboards via Game Center. Quell is available for free for a limited time. It has a 5-star rating with a total of 7198 ratings. Celtic Tribes ($4.99 → Free, 31.1 MB): TODAY ONLY: Receive 300 magic potions, and two golden and three silver artifacts that boost production and defense. That’s a $4.99 value! Take a humble village from obscurity to the top in this online strategy game. Prove yourself to be a fearless leader by recruiting warriors to help battle surrounding villages and eventually overtake them. Gather precious resources to fortify your border and upgrade your facilities. You’re also able to join forces with other chieftains to maximize your capabilities. Celtic Tribes is available for free for a limited time. It has a 4.5-star rating with a total of 541 ratings. iLuv Drawing Vehicles HD – Kids learn how to draw cars, trucks, train, plane and more step by step ($1.99 → Free, 184.3 MB): Does your child love to draw? This educational app will teach your budding artist how to draw cars, trucks, planes, and trains. It guides them through each step of the process with lines to trace and audio instructions. They’re able to choose from a variety of pen colors and sizes, custom background textures, and stickers. It also includes undo and redo, an eraser, a blank page for doodling, and the ability to save your final project. iLuv Drawing Vehicles HD – Kids learn how to draw cars, trucks, train, plane and more step by step is available for free for a limited time. It has a 5-star rating with a total of 9 ratings. Baby Musical Toys – 9 in 1 Games to Promote Baby’s Brain Development ($0.99 → Free, 11.8 MB): Your little one can explore music, sounds, and color with this entertainment app. It features a colorful collection of different objects, shapes, animals, and insects, which can be played like instruments. 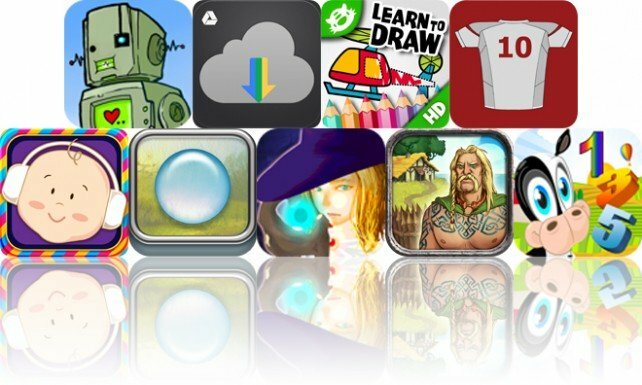 The app includes a total of nine instruments, multitouch support, and interactive items. Baby Musical Toys was designed for children ages six months to two years old. Baby Musical Toys – 9 in 1 Games to Promote Baby’s Brain Development is available for free for a limited time. It has a 4.5-star rating with a total of 26 ratings.